Yumiko looks great , so beautiful , I lost one eye just to keep fidelity to 1/6 format... however can't say what changes the future will bring..
Just a quick fan art of 24" Yumiko. Honestly, didn't really find interest in these bigger versions, but, I'd get her if I had the mula. I'm the same, starting the year broke as... couldn't even do membership. Not that I'm getting one, but do these come with stands? Those on stormy and vader girl look nice. thanks guys!! Out of the bigger versions, Yumi seems to be a stand out for me (guess I'm a sucker for red/white/black combo pieces). Congrats on all you who snagged this one! I asked Ash on Instagram regarding the Stormy girl and he said maybe.....but that did't happen (AFAIK). Shame because what 3A engineered for the show displays seem easy to reproduce and function extremely well. I'd pay extra for one personally. This one looks so nice, very bright colours and cool skirt. thank you Albino! yes, agreed! lol! lottery too! I think a display could be made pretty cheaply. Im thinking to get a flexible lamp and put a clamp on the end. 1/3 lonely warrior TQ just landed in SoCal. First thing I noticed is that the peg hole in the helmet sculpt is smaller than the ball on the neck joint....anyone else notice this? is it a matter of heating it up and forcing it in? Can't say for your specific figure, but that's usually how it is for the female figures. Is the hole on the lady head sculpt as small as on the helmet sculpt? If yes, then you should be fine. And yes, I'd recommend heating up the hole to soften up the vinyl as this will make it much easier for insertion. actually the hole on the head is much larger than the hole on the helmet sculpt...that's why I figured that I would ask. I think it's going to be a blow dryer situation on this one. Mine came in! Looks complete and healthy, haha. Pros: In hand! 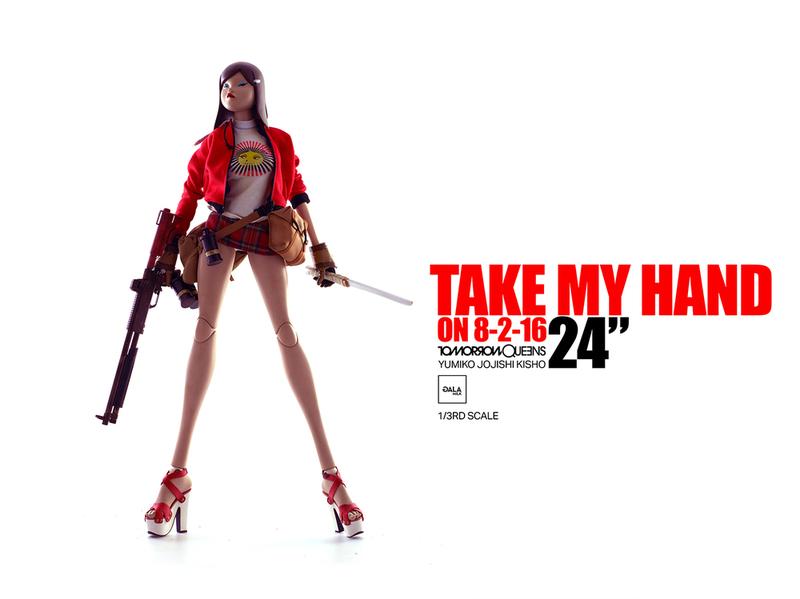 She comes with a good amount of kit including a gun, katana, and 3 sets of hands (gloves) for holding nothing, a gun or katana. Also has 2 white shirts with different TQ graphics (original was just a plain white shirt). Gernades are cool, but not sure where they are supposed to be clipped on. Neutral: I would have like to have a set of hi-top chucks like the 1/6th version, but it was never offered in the first place so it's a push. Just an observation. Negative: Basically just one = joints. I have a 1/3rd Pasha as well and that Pascha (Miyu) has crazy tight ratcheting joints. Moving the legs takes a bit of force but with something standing that tall; I want something solid (think as tight as the Transformers 3A bots). Yumiko, on the other hand, has looser joints. Not sure the joints are considered floppy, BUT I would wager that after some use, the joints will be floppy in short time. I will try to evaluate as objectively as possible but I may need to hit up CS. As she is, she has no chance of standing on her own. She topples under her own weight. I will get pics over the weekend when I can get some shots in the daylight. Thanks for the info Sideglide. I'm missing the second T shirt not already on the figure. I was only going by the preorder list of items included when I figured I was shy the grenades. The knees on mine ratchet and legs seem properly stiff, have not compared to my other 24". Still I guess such a large figure on those shoes is just going to tip over. Will probably get a doll stand. Not sure which stand though. Regarding where to mount the grenades, Worldof3A pictures show the bag swung around the back leaving the bag's belt in front to attach one on the hip, then they had 2 hooked on that bag - why I brought that up is when I was figuring out I was missing the grenades, I thought there might also be a belt to mount them on missing, but the photos look like it's the bag's belt. Yea, looking at the original image, the grenades seem to just be on the bag belt. Dunnot how that works since she has 6 bags/pouches around her like a flotation device. I will obviously need to make some room and take a few off. Sorry to hear you had trouble with the missing grenades and shirt. Hopefully CS will get you all sorted. I just tested the joints again, and I think they are OK. Still, compared to the Miyu, Yumiko is 20% looser in the upper thigh/hip socket. I held her out sideways and she will "plank" OK with her upper body. I think it is acceptable but will hope that any future 1/3rd scales have tighter joints for creating any kind of pose other than standing straight. As for a stand, I ordered the BJD stand pointed out by x43x who was pointed out by Gregory. It holds well with rubber on the clamps so as to not scratch. The flexi-arm on it is strong enough to hold a 1/3rd scale just fine. I would recommend getting the 70mm version of the stand. Same base size as the 1/3rd, but the poll is 10cm longer which should give more posing options. The 1/3rd length barely works with the pole extended straight up to its max height. ThreeA should be including the stands for all 1/3rd figs, even if they have to raise the price a few bucks. I ordered the standard but I think they sent me the 70 length. My base is a big round base, and yours has edges. Can you send a pic of where your stand reaches? Mine has a 15 degree bend and reaches, at an upward angle, the mid section of the body. I will also post a pic when I get home. Anyone have pics of these 1/3 TQ's? I haven't really seen any in hand pics. Does anyone know if they are ever going to release the 1/3 TK that was shown years ago?